Páirc Uí Rinn was declared unplayable before throw-in yesterday. AFTER RAIN CAUSED chaos with the hurling league fixture list yesterday, the GAA have announced today that the postponed games have been re-fixed for next Sunday afternoon. 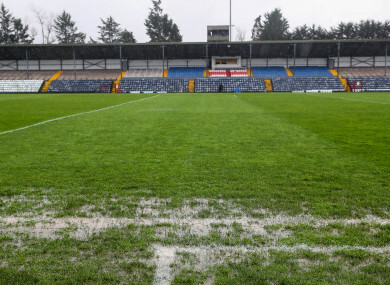 Three clashes in Round 5 were postponed due to waterlogged pitches at Páirc Uí Rinn, Walsh Park and Innovate Wexford Park. Next Sunday will see Cork entertain Tipperary, Waterford host Galway and Wexford at home to Kilkenny with a throw-in time of 2pm for all matches. On Saturday night the first Division 1 quarter-final will take place with Limerick away to Laois in O’Moore Park in Portlaoise at 7pm. Yesterday’s postponements will have a knock-on impact for the remainder of the 2019 hurling league with the GAA revealing a new fixtures plan after today’s meeting of the CCCC. Full details around timings and venues for the games will follow but there is a possibility of quarter-final ties on Bank Holiday Monday 18 March with the Sunday preserved for the All-Ireland club finals in Croke Park and a full round of football league fixtures pencilled in for Saturday 16 March. The hurling league final will now be on the same weekend as the football equivalents. The GAA stated today ‘the main aim of the CCCC when considering these rearrangements was to minimise disruption to the scheduling of club games in April and May’. Email “GAA issues new hurling league fixture plan after 3 games rained off yesterday”. Feedback on “GAA issues new hurling league fixture plan after 3 games rained off yesterday”.